Hello and thank you for looking. 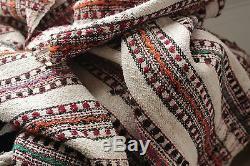 This beautiful textile is a vintage. 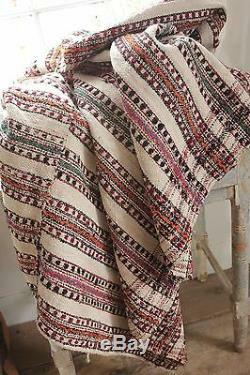 Hand-woven hemp and wool , hemp and cotton blanket A wonderful folk art textile! 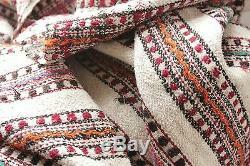 This stunning blanket is all woven by hand in the Carpathian Mountain Region of Europe about 100 years ago this blanket comes from a personal collection, they are rare and wonderful The colors are: warm, natural creamy off-white, deep charcoal brown. Greens, blues , reds, and a lovely cranberry tone. 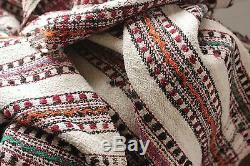 It is constructed by hand weaving the 2. Lengths, and they are machine stitched together. 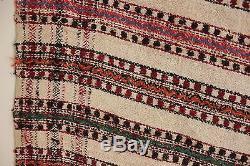 This textile weighs 4 pounds and 4 ounces. 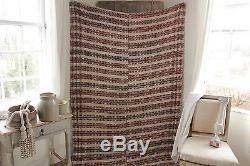 It would make a STUNNING throw or bed cover or could also be used as upholstery fabric, heavy curtain or a perfect gift for any textile lover and a wonderful textile for any collection! CONDITION : This blanket is in as found, unwashed condition. This textile has some holes, doted around. About 6 , the size of quarters. There is some thread loss from wear too (condition reflected in the price). 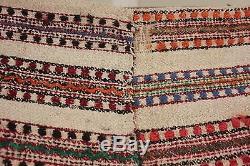 MEASUREMENTS : This wonderful textile measures 53 inches wide by 79 inches long. You will never have to pay. 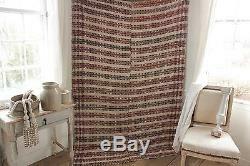 The item "Vintage folk art throw blanket Homespun wool linen hemp cotton plaid handwoven" is in sale since Thursday, January 4, 2018. 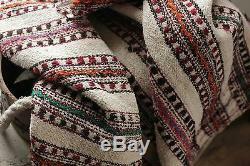 This item is in the category "Antiques\Linens & Textiles (Pre-1930)\Bed & Bath Linens\Blankets". The seller is "loodylady" and is located in Burlington, Vermont.